The ATO issued a scam warning about a fraudulent email. Source: Getty. Unsuspecting Australians are being targeted by a “misleading” email that appears to have come from the Australian Tax Office (ATO) and promises customers a refund. The ATO has issued a warning about the fraudulent email on its website, advising customers not to click anything in the email as it contains a “malicious link”. The email contains a fraudulent link that directs users to a fake tax refund form which has been set up in a bid to steal people’s personal information. 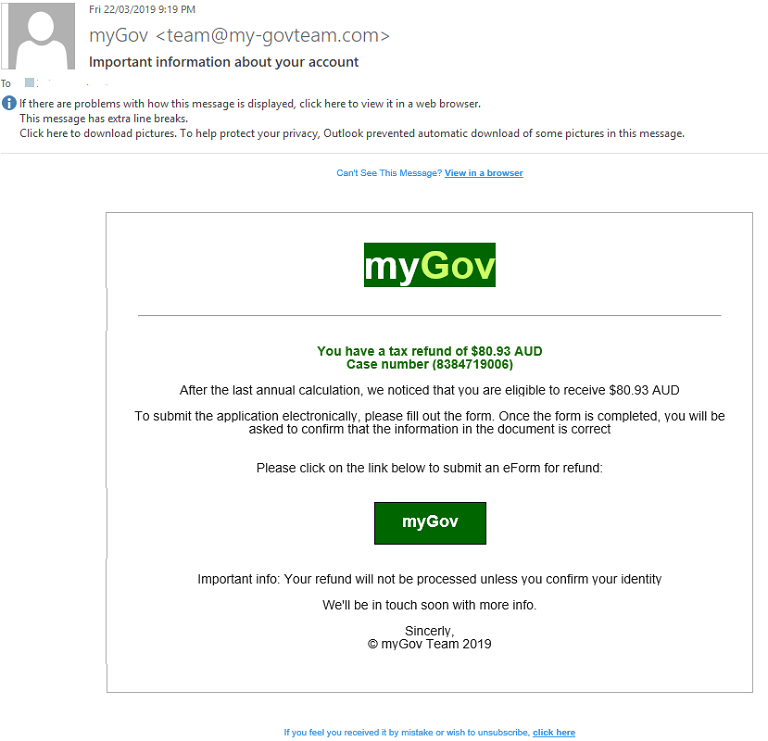 “Scammers are emailing people from a fake myGov email address, asking them to fill out an application to receive a tax refund,” the ATO said in a statement. This is what the fake email looks like. Source: ATO. The ATO released a list of characteristics for consumers to keep an eye out for if they suspect they have received a fraudulent email, including “poor grammar and spelling”, a request to click a link that does not lead to a my.gov.au . address and any correspondence that does not include your correct name. Earlier this week, Aussies were also warned about another scam targeting NBN customers after NBN Co issued an urgent warning after scam reports relating to the internet service skyrocketed over the past five months. The company, responsible for building and upgrading the country’s telecommunications and broadband network, said it has seen an 84 per cent increase in enquiries about suspected scams since October 2018, as scammers try to squeeze money out of Aussies as the NBN rolls out across the country. Have you ever fallen victim to a scam? Do you exercise caution when clicking links in an email?